Explore map of Hawaii, a US state located in Oceania. The only US state state located outside of North America, Hawaii is made up entirely of islands and is the northernmost island group in Polynesia. Hawaii is the 43rd largest state of the country comprising an area of 10,931 square miles. As of 2016, Hawaii comprised 1,428,557 people, which made it the 40th most populous state of the country. Honolulu is the capital of Hawaii as well as its largest city, while the island of Oahu is the largest metro of the state. Mauna Kea, which is a dormant volcano and has a height of 4,205 meters, is the highest point in the state. Hawaii was admitted to the Union on August 21, 1959, as the 50th state. About Hawaii Map - The map of Hawaii depicts, major cities, other cities and the state capital. The state and interstate highway, vegetation, national park, airport, mountain peak, and main attractions are also clearly demarcated on the map. The official flag of Hawaii consists of the Union Flag of the United Kingdom. There are 8 stripes in the sequence of red, white, blue colors starting from bottom. It was adopted on 29th December 1845. Located in central Pacific Ocean, Hawaii is the southernmost state in the United States. Located in the Oceania, Hawaii is the only state with Asian plurality and archipelago. Nicknamed 'The Aloha State', it is the 8th smallest state by area in the US. The first settlers in Hawaii were the Polynesians of the Marquesas Islands. These settlers arrived on the islands some 1500 years ago, sailing for over 2000 miles in canoes. The second wave of immigrants came in the 11th century from Tahiti. The first recorded European contact was made in 1778, when Captain James Cook set foot on the Waimea Bay in Kauai and named the islands "Sandwich Islands". In 1791, Kamehameha − a North Kobala native - united all the major islands and created one royal kingdom in 1810. The American colonists eventually overthrew the kingdom in 1898. During the 20th century, with the boom of the islands' sugar and pineapple economy, immigrants from all over the world began arriving. It was on August 21, 1959 that Hawaii became the youngest and 50th state of the US. The archipelago is roughly 2,000 miles (3,200 km) southwest of the West Coast of the US. 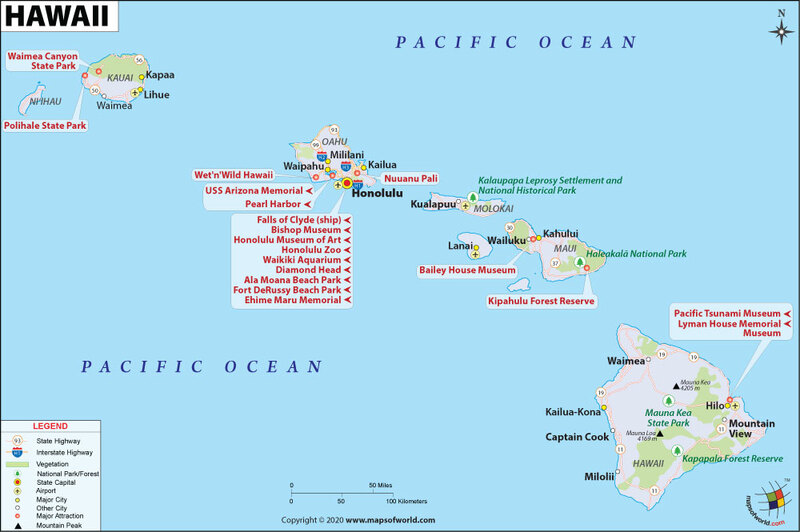 Out of its eight main islands − Hawaii, Maui, Niihau, Kauai, Oahu, Molokai, Lanai and Kahoolawe − seven are permanently inhabited. The main island of Hawaii is also known as the Big Island. There are however, hundreds of islands in Hawaii, which are spread across 1,500 miles. Stretching for 750 miles, the state's coastline is the fourth longest in the US. At 4025 meters, Mauna Kea is the highest mountain in the state. Kilauea spills more lava than any other volcano in the world. Waianuenue Falls, Akaka Falls, Olo'upena Falls, Waipoo Falls and Waimoku Falls are the most jaw-dropping streams in Hawaii. The Papahanaumokuakea Marine National Monument comprises of an area larger than all other US national parks combined. Tourism is a significant part of the state's economy. From waterfalls to volcanoes and beaches to sea cliffs, Hawaii offers everything travelers ask for. The state has endless thrills to experience for honeymooners and solitude seekers alike. Hawaii, a paradise of the Pacific, remains a favorite destination for mainlanders looking for a taste of Polynesian culture. One of the most visited attractions is the USS Arizona Memorial, which evokes the tragedy of Pearl Harbor during the Second World War. Another popular tourist attraction is the Polynesian Cultural Center, which is a living museum of live performances and simulated tropical villages with dancing, feasts and live exhibitions of Polynesian arts and crafts. Hawaii Volcanoes National Park, Waimea Canyon State Park, Waipi?o Valley, Hanauma Bay and Molokini offer plenty of recreational opportunities ranging from snorkeling to hiking. Served by several intercontinental flights, Honolulu International Airport (HNL) is the gateway to Hawaii. A public transportation (TheBus) connects this airport via routes 19, 20, and 31. Even though Hawaii has the only unified statewide public education system in the country, it has the highest rates of private school attendance. The University of Hawaii in Manoa (and campuses at Hilo and West O?ahu) is the most popular institution. Read more here.